AUSTIN TROUT: "AFTER WE DISPOSE OF THAT CHUMP MUNDINE, WE'LL BEAT ANYONE"
"I didn't want this guy, but my manager said this would be a good tune-up for Mundine, my mandatory. Being a fan myself, I know what I can do. I just gotta get that name people respect and beat the hell out of 'em. After we dispose of that chump Mundine, we'll beat anyone. Kirkland, Angulo can get beat up again. You get the public's respect, you're gravy...Until I get the letter saying I have to fight Mundine next, I can face whoever. The winner of Cotto-Margarito is first. Next is 'Canelo', since he got that WBC title. I would say it's even between those two. Then after getting the belts, K9 [Cornelius Bundrage] has one. After unifying the titles, then I'll go down the list," stated WBA jr. middleweight champion Austin Trout, who talked about his recent victory, his future plans, and much more. Check it out! DK: Congrats on successfully defending your title against Frank LoPorto. How are you feeling? AT: I'm feeling good, feeling good. It was definitely a blessing how it all worked out how things were going with the promotion. The local promoter was paid to do a job and he didn't do it, but my promoter did a great job in a week and a half. I was afraid no one was going to show up, bUt there was a lot of support. I give my performance about a 7 or 8, but there is still a lot of improvement for me to do. DK: What was it like headlining a card in front of your fans only 30 miles from your hometown of Las Cruces, New Mexico? AT: It was like a dream come true. I used to daydream about having family and TV there, and the crowd gave me a boost. I felt like I could have thrown 100 punches a round for 15 rounds. DK: How did you get into boxing? New Mexico isn't exactly a hot-bed for fighters. AT: My mom was a big fight fan that used to go to matches. When we came here, the only person who did the fights, people would always come to our house. The heavyweight fights, everyone would watch, but the lower weight class fights, most people would come over and I was always a fan. When I found out there was a boxing gym in town, I never thought there would be one. I thought I had to go to Philadelphia and it would be like Rocky (laughing). It was like love at first sight. It was something about the smell or something that I just fell in love with. DK: A lot of people, and I'll be completely honest with you, myself included, still aren't convinced you are ready for the big stage. My belief comes from you not having the major notoriety or the big name win on your resume, not because of your ability. How do you prove all the doubters wrong? AT: I'm just trying to change that. I didn't want this guy, but my manager said this would be a good tune-up for Mundine, my mandatory. Being a fan myself, I know what I can do. I just gotta get that name people respect and beat the hell out of 'em. After we dispose of that chump Mundine, we'll beat anyone. Kirkland, Angulo can get beat up again. You get the public's respect, you're gravy. DK: (Laughing) I like that answer. You called out all of the 154-pounders to come and take your title if they don't think you deserve it. Who do you want to face next? 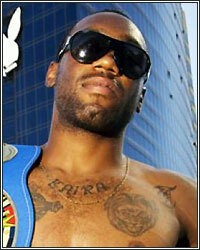 AT: Until I get the letter saying I have to fight Mundine next, I can face whoever. The winner of Cotto-Margarito is first. Next is "Canelo", since he got that WBC title. I would say it's even between those two. Then after getting the belts, K9 [Cornelius Bundrage] has one. After unifying the titles, then I'll go down the list. If that don't work, I'll do it the other way and go down the list and then unify the titles. DK: We've got a big fight card on December 3rd featuring 4 big names at jr. middleweight. Who do you think wins the Cotto vs. Margarito rematch and why? AT: I think Cotto is gonna win because one, he has a lot to prove, two, he has it in his mindset this is redemption, and three, Margarito got beat up bad by Pacquiao. Cotto still looked good even though he was the same old Cotto. Margarito looked terrible after the suspension and Pacquiao did some serious damage. I don't know because whether Margarito cheated or not, his chin is still there, so that's a close call and Cotto couldn't put him down the first time; neither could Pacquiao. DK: What about the Wolak vs. Rodriguez rematch and why? AT: I think Rodriguez is gonna win this one. He figured out late how to beat Wolak, but it was too late and Wolak only goes one way, so I think Rodriguez. AT: (Cutting in) Besides beatable, because that's the first thing that comes to my mind. And I'm a fan too, but as a boxer, I just watch and think, "Man, what I would do with you?" AT: Short. Over the hill. AT: Over the hill. Past his prime. AT: Um, he's like a dumb warrior; not intellectually, but how he fights. You know, warrior; entertaining. AT: Entertaining as well. Good boxer. Puncher. Beatable. AT: Lot of big mouth, small balls. AT: He's a warrior. If he was handled better, I think he could be a contender, but I think he's past his prime. AT: (In his best Muhammad Ali impression) The best! Going up there as being one of the greatest, and is gonna dominate this with pure excitement and skill. DK: (Laughing) Thanks for the honesty champ. When do you expect to be back in the ring? AT: I'm trying to gun for the end of December. We're gonna watch to see what happens with Cotto-Margarito, but I wanna stay busy. DK: I got ya. Any final thoughts Austin? AT: I thank God for everyone that tuned in and will be tuning in. Win, lose, or draw, everything goes to God, and I fight like every day is my last. I hope you guys appreciate my heart. DK: Thanks for the time Champ.